1. T-217 (or whatever it’s called) the one with him Wearing the pea coat. 2. Has to be the Cracker Jack, right? 4. The strip card in my avatar ? 5. The poker cards with JJ on them? Any JJ type 1 photo has significant value. Individual or with his team. T210 is #1 and the e90-1 is also up there, probably just ahead of the cj. There are a total of 11 of them in PSA and SGC POP Reports. Take into consideration a cross here and there. There may be less than 10 in the world. Assuming the same grade, here are Jackson’s Top 10 Cards by value. Note that the Texas Tommy issues are near impossible to find with only a few known to exist. The 1916 M101-4/M101-5 issues include some very scarce ad backs that might realize significant pricing premiums vs. the standard M101-4/M101-5 subjects. I have excluded the extremely rare 1917-‘20 M101-6 Felix Mendelsohn Jackson from the list for which I have only seen a single example. Last edited by Vintageclout; 05-27-2018 at 12:17 AM. Nice list. No T5 Pinkerton Joe? Oops....You got me Leon! Forgot about the T5 (I knew I would inadvertently leave one big card off the list). Value wise, the T5 Jackson should probably be placed at #4, directly between the Texas Tommy and the E90-1 Rookie. This would push the 1919 W514 off the top 10 list. Thx Leon for the “heads up”! I`ll 2`nd that, let`s see those bad boys ! If you change your mind and decide to contract your collection, I would be happy to relieve you of the e90-1, the Boston store and the m101-5. I could never get tired of looking at your NM 7 Jackson CJ. Truly a magnificent specimen! Agreed. We should have a Net54baseball Hall of Fame for Vintage Baseball Cards. That one would be a first round shoe-in!! Well you have one hell of a start on your Jackson collection sir. Thanks for sharing, like the cards but really the photo is where it`s at for me. Enjoy !! Last edited by pcoz; 05-27-2018 at 01:06 PM. 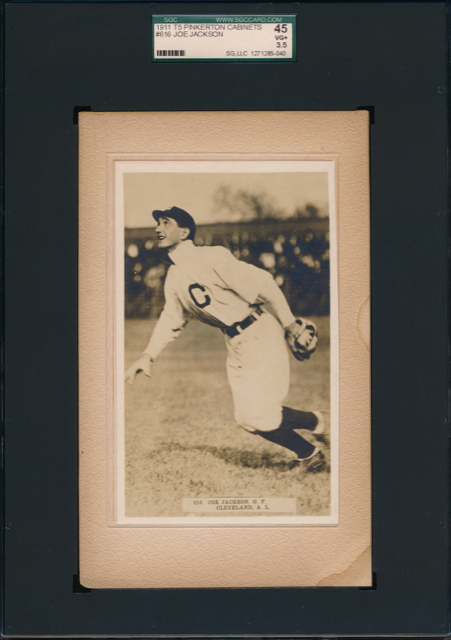 Type 1 Murnane photo from the first offical All-Star in 1917. Last edited by BeanTown; 05-27-2018 at 01:38 PM. That Pinkerton is an amazing card and a high grade for for that card. Where I live you could’ve bought a new house for that card. Then again, since I’m not homeless (yet!) I’d take the card any day. What a beauty. Nicely done! What about the E270 Tin Top? It did spawn one of the all-time great threads here on Net54! Last edited by Steve D; 05-27-2018 at 06:09 PM. Last edited by MattyC; 05-27-2018 at 06:43 PM. LOL I can't stop laughing. Matt that should be your signature line. Great CJ. A fourth tier Jackson for the thread. had NO idea what you were referencing, but thankfully there's a "search" function on the 54 that enlightened me! holy sheeyit - Skydash is a legend! amazing "find"! - hoping all turned out well for him and his family!! just another green-with-envy S.O.B. that wishes that I one day will run across such an amazing, RARE, fresh-to market batch of stuff, especially after being (perhaps due to the initial skepticism) ripped a new a-hole upon my initial semi-public forum disclosure, as was The Skyman! The recent discovery of a truly jaw-dropping vintage collection new to the vintage hobby was recently announced by Mastro Auctions. 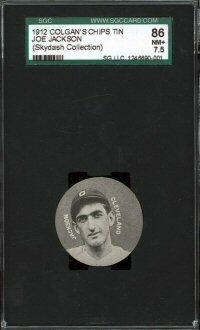 The collection includes over 1500 cards from around 1910 (the middle of the deadball era). The collection is nicknamed "Skydash" by its owner, who prefers to remain anonymous. The part of the collection that has captured the attention of many vintage collectors are 229 examples of the well-known but relatively obscure Colgan's Chips "Tin-Top" series. Astonishingly, the new discovery includes seven players from the set that previously have not been known to today's vintage collectors. Images for all seven of these cards are shown above. In addition, four variations to cards of previously known players were discovered in the collection. Perhaps just as astonishing is the Near Mint plus condition of the obscure cards, some of which have already been graded by SGC, one of the hobby's leading grading services. Scans of the graded Thorpe and Jackson examples are shown at right. The "Tin-Tops" are one of three related sets produced from 1909 through 1912 by Colgan Gum Company of Louisville, Kentucky. Many of the player poses are common among the three sets, distinguished primarily by the ad messages on the card backs. The cards from all three sets are round and were distributed inside small metal canisters of chewing gum. All cards measure 1-1/2 inches in diameter--the same size as a silver dollar. They are designated as sets E254 (Stars of the Diamond), E270-1 (Red Borders) and E270-2 (Tin-Tops) in the American Card Catalog and by common hobby usage today. A Set Summary (including a table that compares the three Colgan's sets) is provided on the Old Cardboard website. Pete Calderon, a vintage card specialist at Mastro Auctions, describes the Skydash Collection of E270 Tintops as the "perfect storm" of rarity, condition and subject matter. "The sheer number of rare E270s in the collection is mind-blowing," says Calderon. 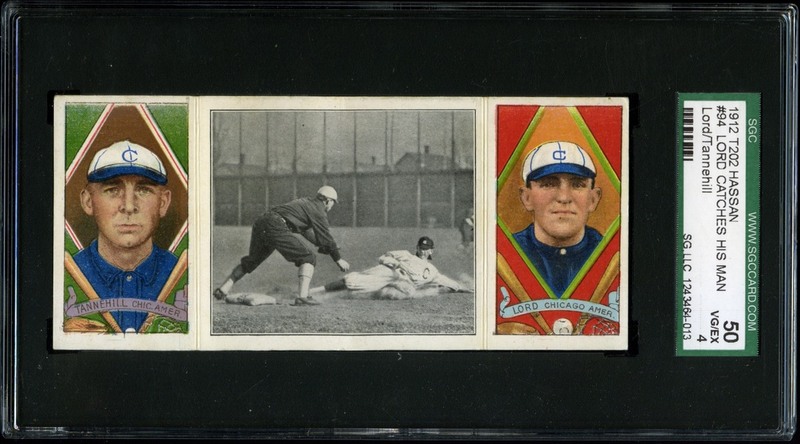 According to Calderon, the four previously uncataloged "variation" cards found in the collection were those of Donnie Bush (small and large image; same pose), Hal Chase (Chicago and New York teams), Jake Daubert (dark and white caps; two different poses) and Honus Wagner (curved and straight vertical lettering). Going to make my 1000 post a special one. Here is Joe Jackson on a RPPC when he played for the Vic Mills team and a type 1 photo of him, with the same team. Last edited by BeanTown; 05-29-2018 at 09:03 PM. Nope, thats Buck Weaver just right of Cobb. Do you see Joe Jackson in the picture? Ill give you a hint that he is on the top row. I’m gonna say Shoeless Joe is just to the left of the dude in the suit (our vantage point). If not, it’s gotta be the guy to the right of Cobb. If it’s not one of the guys with the big “S” for Black Sox then I give up! I’m gonna say Shoeless Joe is just to the left of the dude in the suit (our vantage point). This is correct. Joe Jackson is pictured immediately to the left of Connie Mack. Cobb is sandwiched between Ray Chapman on the left and Buck Weaver on the right. Your history of baseball is remarkable. Did you notice Joe isn’t wearing any socks? He actually has his shoes on for once, but he’s wearing no socks! He couldn’t even get his wardrobe together for the first all-star game! I thank you all for sharing your knowledge, photo’s of the cards and the amazing photo of the early days of Joe Jackson career. Am surprised no one yet has cited the infamous T202 Lord Catches His Man, alleged in an epic Net54 thread to be JoJax hisself. Used to have an E90-1 and a '15 Cracker Jack of the man but sold them to finance a bathroom and a kitchen reno. My wife has a special fondness for the Shoeless One. Try putting a WTB in the BST section of the forum. It will get a lot more eyeballs than in the middle of this thread. Nice Joe Jax's by the way!! Those are Still Baller Cards to Me LOL. I can't believe that's a '14. Holy mother of God. Here is my LINK to my collection. Really great cards so far. Congrats on the pick ups. I need me some Shoeless but have none now.